The franchise’s image has improved dramatically, and Lacob is partially responsible. 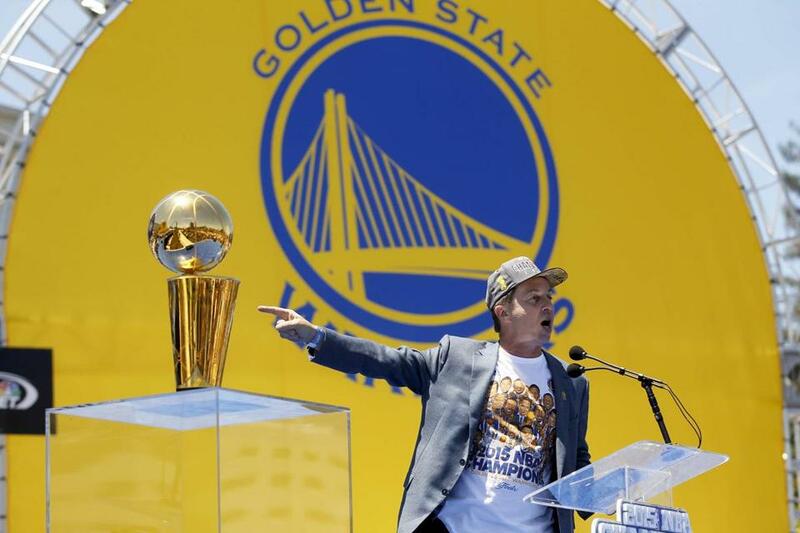 Warriors co-executive chairman and CEO Joe Lacob pointed toward the Larry O&apos;Brien Championship Trophy during the team’s celebration in downtown Oakland. Joe Lacob sat against a wall outside the Warriors’ locker room following Game 6 of the Finals, his cap and championship T-shirt drenched in champagne as he basked in the glory of bringing the franchise its first NBA championship in 40 years. Lacob sold his minority stake in the Celtics in 2010 to join a group to purchase the Warriors. And as owner of the Warriors, he and his partner — movie mogul Peter Guber — were determined to upgrade the reputation of the franchise, produce a winner, and take major steps in relocating the team to San Francisco while changing its brand. So far, so good for the ownership group. The Golden State Warriors are champions, transforming from laughingstocks to a model NBA franchise in five short years. It’s light years from when former owner Chris Cohan was booed by Bay Area fans during the 2000 All-Star Game in Oakland, and when the organization was deciding whether to sign Erick Dampier to a long-term contract. The image of the franchise has improved dramatically, and Lacob is partially responsible. “Relief, to some extent,” Lacob said when asked to describe his reaction to the final seconds of Game 6. “We had dreamed about this. Sometimes when a dream comes true I think it sort of takes you a few days to have it sink in. The Warriors made the bold move of parting ways with coach Mark Jackson after last season, despite the club losing in seven games in the first round of the Western Conference playoffs to the Clippers. The ownership group also decided to invest money in upgrading the roster, something that did not always occur with previous ownership groups. The Warriors signed stars Stephen Curry and Klay Thompson to extensions, signed David Lee to a mammoth deal, as well as inking Andrew Bogut and Andre Iguodala. The depth that carried the Warriors through the playoffs came at a hefty price. Lacob had to determine what type of owner he could be with his new team. With the Celtics he was behind the scenes because he was a minority owner. The feeling of winning the title with the Celtics in 2008 was dramatically different. It was more subdued. The move to San Francisco remains a controversial one. The group is planning to move into a new arena in the Mission Bay district by the 2018-19 season, but during the team’s victory parade Friday, fans screamed to keep the franchise in Oakland while city politicians congratulated the team. 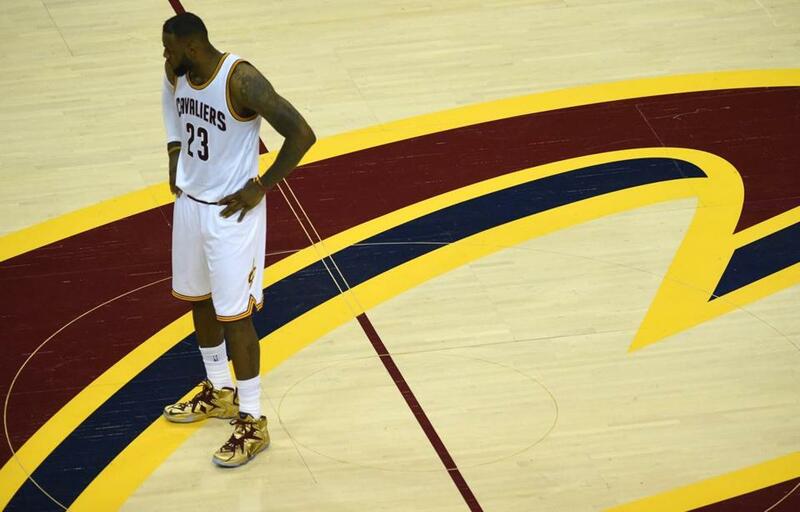 LeBron James stands at center court during Game 6. The Cavaliers just didn’t have enough. They were two All-Stars short of pushing the Warriors to the brink in the NBA Finals. But they still could have won the series if they had a capable supporting cast to relieve LeBron James, who looked exhausted by Game 6. James was partially to blame, however, for the Cavaliers being shorthanded. While they were a contender with Kyrie Irving and Kevin Love, the Cavaliers needed to be near perfect when they were felled by injuries. But they weren’t, and coach David Blatt obviously did not have enough confidence in the players that James handpicked to help out in those situations. Mike Miller, Shawn Marion, James Jones, and Kendrick Perkins were chosen by James to add championship experience and know-how in crucial moments. Jones, however, was the only one of that quartet to play significant minutes in the playoffs. Miller played 28 minutes in the Finals. Marion did not play at all. Perkins played three minutes in Game 4. 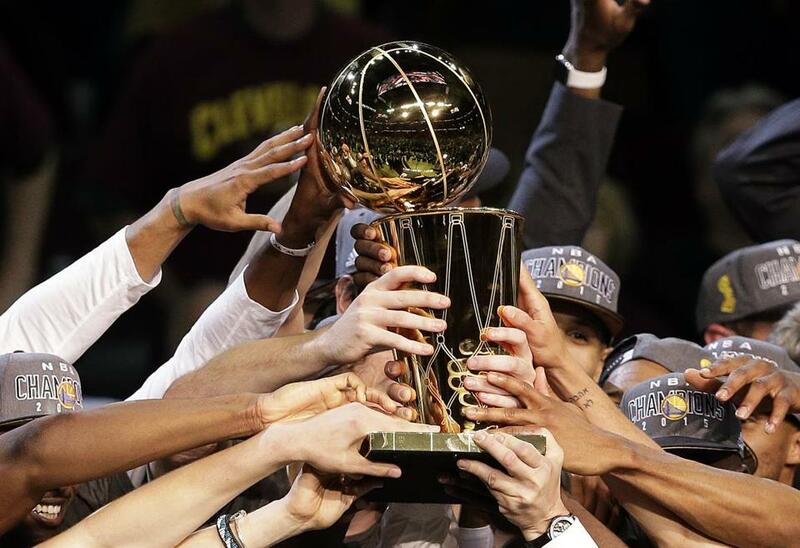 Those veterans filled Cleveland’s bench, forcing Blatt to play seven players during the Finals. James acknowledged after Game 4 that he was “gassed,” but his teammates couldn’t compensate early in the fourth quarter and he was forced to reenter the game with 10 minutes left, obviously fatigued. Average minutes in the Finals for four Cleveland role players. Although the Cavaliers were a strong club, they were top-heavy and couldn’t afford to be. The bench help wasn’t really help at all, especially when Matthew Dellavedova and Tristan Thompson were called on to start after Irving and Love went down. Cavaliers general manager David Griffin said the core of the team will return, and that is only if Love opts into the remainder year on his contract or signs an extension. Blatt, a Framingham native, is a strong-minded coach who was offended by those who referred to him as a “rookie head coach,” ignoring his vast international experience. But it became apparent during the season that James trusted associate head coach Tyronn Lue and assistant coach Larry Drew more than Blatt. While Blatt can be credited for helping the defense improve during the season, there’s a question as to whether he is capable of leading the Cavaliers to a championship. “I think it’s a special thing to have the opportunity to work with LeBron on a daily basis,” Blatt said. “People, they sometimes judge things on a game or a period of time and they forget that we’re working together and striving to make the utmost of our team and our situation day to day. And a bond develops over time that is a lot more than what meets the eye. Net production (per 100 possessions) in the playoffs for the Cavs' top five-man combinations. A despondent James lamented the team’s injuries, which included being without rebounding machine Anderson Varejao for most of the season. “I’ve been watching basketball for a long time. I’m a historian of the game. I don’t know any other team that’s gotten to the Finals without two All-Stars,” James said. “I cannot remember thinking of it. I don’t even know if it’s ever happened, for a team to lose two All-Stars and still be able to make it to the Finals. The question is whether good health will solve everything next season. Oddsmakers in Las Vegas already have tabbed the Cavaliers as the favorites to win the NBA championship — of course, that’s if James and Love return. James has an opt-out clause but is expected to sign a lucrative extension. “We had many chapters in the season. I don’t know. I mean, for me, it’s never a success if you go out losing,” James said. “But I think we put ourselves back where this franchise needs to be, being a contender. But we’ve still got a lot of work to do. Tried as much as we could to try to make up for those guys, but it’s a lot of talent sitting in suits. 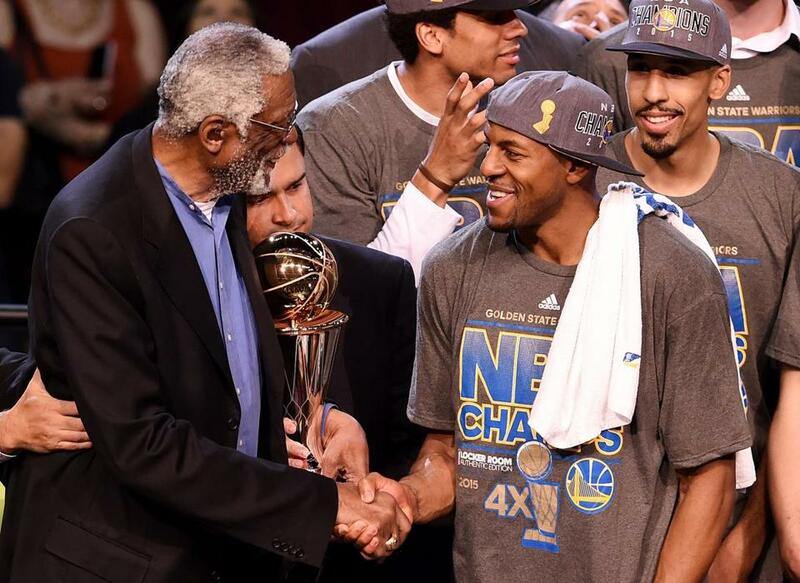 Bill Russell awards Andre Iguodala with the Finals MVP trophy, named after Russell. Bill Russell remains the face of the NBA’s rich history, and he travels to every potential clinching Finals game to deliver the award for Most Valuable Player, which is named after the Celtics legend. Russell was at Game 6 on Tuesday and presented the award to Golden State’s Andre Iguodala. After performing his duties, Russell, 81, could have been whisked away until next year. That isn’t what happened. After four-time league MVP LeBron James, who has won the Bill Russell Award twice, promised to speak with Russell after Game 6, Russell, sitting in a wheelchair, waited for an hour after the game to not only speak with James, but take photos with Iguodala. Players coming out of the Cavaliers’ locker room and heading home found Russell sitting there, and they greeted him with humility. Former Celtic Kendrick Perkins shook Russell’s hand, and Russell responded with his trademark cackle. Russell’s people asked him on more than one occasion if he wanted to go to his hotel or at least wait in the arena’s green room, which was more quiet and had refreshments. Russell refused. James asked him to wait, and Russell did. Russell recognized every player who stopped to talk to him, including humbled Warriors forward Klay Thompson, who was still in his champagne-soaked uniform. It is admirable that the NBA continues to celebrate and honor Russell, arguably the league’s greatest living player. While he may have trouble with his hearing, Russell is a living example for today’s generation of players, many of whom were in grade school during Michael Jordan’s last NBA title. The NBA has done a fine job embracing its history and heritage, inviting former players to participate in league-sponsored events such as All-Star Weekend and NBA Cares, celebrating the standouts of the past. Russell is No. 1 on that list, the winningest player in NBA history and one of its more dominant players. And it says a lot about Russell that he would wait for James to lament the Game 6 loss and then dress before they met. Russell should continue to be a presence at NBA events as long as he is able, and it was heartening to see current players not only recognize him but cherish his presence. There were years when Russell wasn’t such an important part of league celebrations. But a few conversations with David Stern enticed Russell back, perhaps one of the most overlooked moves of the former commissioner. And Russell is indeed giving back. He loves to talk, offer his knowledge, and spend time with current players. Quietly, it also seems that Russell enjoys being lauded late in his life. Whatever issues he had with the NBA have dissipated, and the league has given him the proper appreciation for what he has accomplished. So, while it was an unusual to see Russell waiting for James well after midnight, it was heartwarming to watch those who paused to marvel at Russell. He definitely noticed. A bystander in the relationship between James and Cavaliers coach David Blatt is associate head coach Tyronn Lue, who is being credited, at least partially, for the team reaching the Finals. Strangely, Lue was not a candidate for the league’s open coaching positions. While three of the four were filled by retread coaches — the other filled by Iowa State coach Fred Hoiberg — Lue remains waiting for his opportunity . . . Now that Doc Rivers has traded Matt Barnes and Spencer Hawes, the next Clipper to go could be shooting guard Jamal Crawford, who has one year left on his contract. The Clippers have a handful of free agents and will try to clear salary cap space to not only re-sign DeAndre Jordan but add depth to the bench. There is definite interest by the Clippers in former Celtic Paul Pierce, who has a player option with the Wizards for next season. Pierce could be the Clippers’ short-term answer at small forward but likely would not play more than 30 minutes per game with Los Angeles. Lance Stephenson was acquired at small forward, but the Clippers would like to upgrade at shooting guard and acquire a backup center. Rivers, by trading Hawes to the Hornets, acknowledged a major mistake in putting faith in the journeyman, who didn’t appear prepared to play for a contending team . . . An interesting call on a player option comes from Brooklyn, where swingman Alan Anderson has to decide whether to accept a $1.33 million contract for next season. Anderson improved his value by being a key reserve for the Nets the last two seasons. He shot 44.3 percent from the field and 34.8 percent from the 3-point line this past season . . . Celtics forward Kelly Olynyk visited Collicot Elementary School in Milton last week to talk about the importance of math. Olynyk said he has been working out in Waltham for the last two weeks . . . Kit Ackermann, also known as “Lucky” the Celtics mascot, will appear on an episode of “American Ninja Warrior.” Ackermann could not comment on his performance until the show airs.